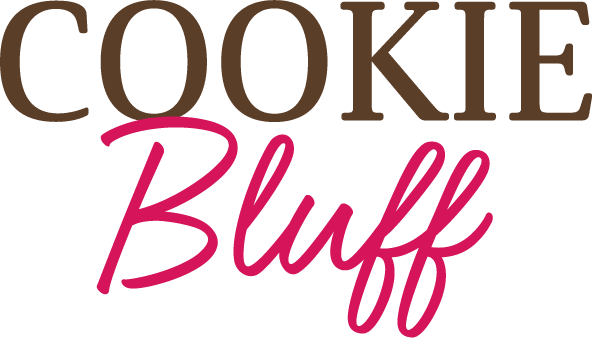 Cookie Bluff | The cookie dough reinvented to eat raw! is reinventing the way people enjoy cookies! It’s all about the dough. A dessert that will put a smile on everybody’s faces. 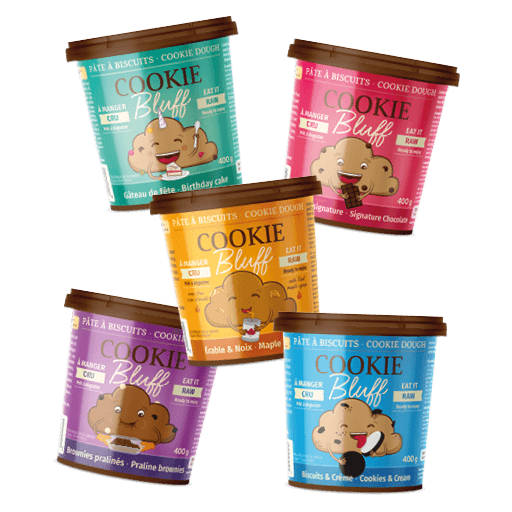 Unique and versatile, you can eat our cookie dough raw, cook it or mix it with lots of other desserts. Try it with ice cream—it’s so decadent! And yummy! Overflowing with real ingredients: real butter, real maple syrup, real hazelnuts, real high-quality chocolate! And most of all, our cookie dough is made with real love! Egg-free! That means even your nephew who is allergic to eggs can eat some. Just make sure he saves some for the rest of us! No added palm oil. Because we love orangutans—and monkeying around too! sugar | psyllium fibers | dextrose of culture | natural aroma | sodium bicarbonate | salt. Shop mind-numbingly for all the necessary ingredients to make high-quality cookies. Admit it: you’re always missing something! Clean a messy kitchen that has become a disaster zone with flour and dough everywhere! 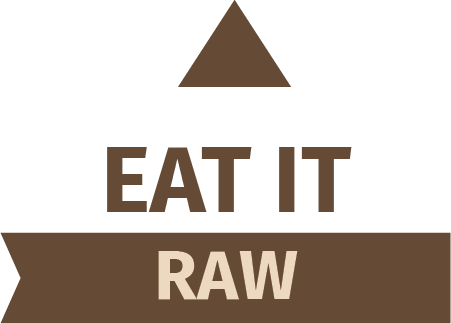 Worry about eating raw. Our cookie dough was made to be eaten raw! It’s safe. And it’s oh-so good! Hooray! Ditch the hassles! Experience easy peasy and delicious Cookie Bluff. Find out where to buy our products! 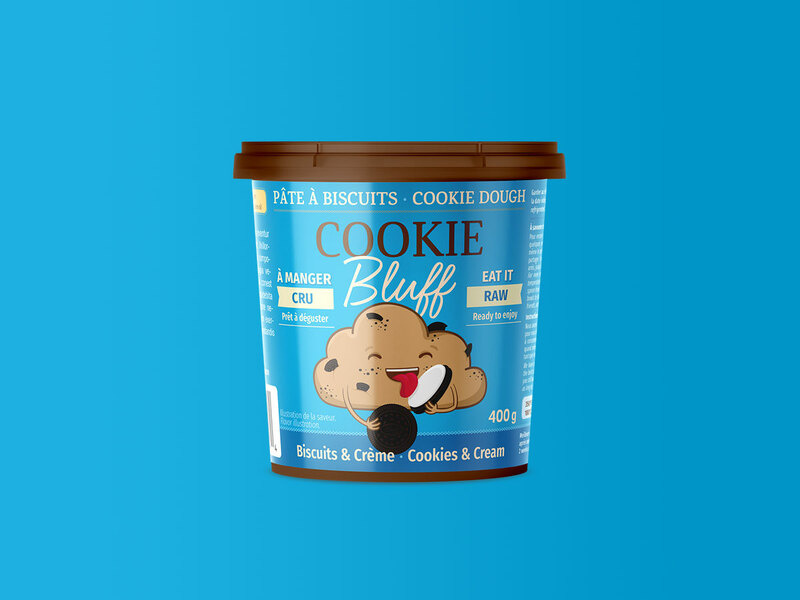 Cookie Bluff continues to reinvent cookie dough! Oh snap! We dropped a huge amount of Oreo cookies in our cookie dough. But the result is amazing! The taste is so creamy that it’ll melt your heart. Discover our new, decadent flavour of raw cookie dough: Cookies and Cream.